Not much to say about Still Life, a simple watercolor study of fruit in a bowl. The bowl was, is, a wooden one we picked up somewhere and still resurfaces occasionally to hold fruit, or some other snack, or munchies. The fruit, delicious, the pear juicy – hmmm. More than a simple study after all, a memory, a taste of the past with promises of the future. 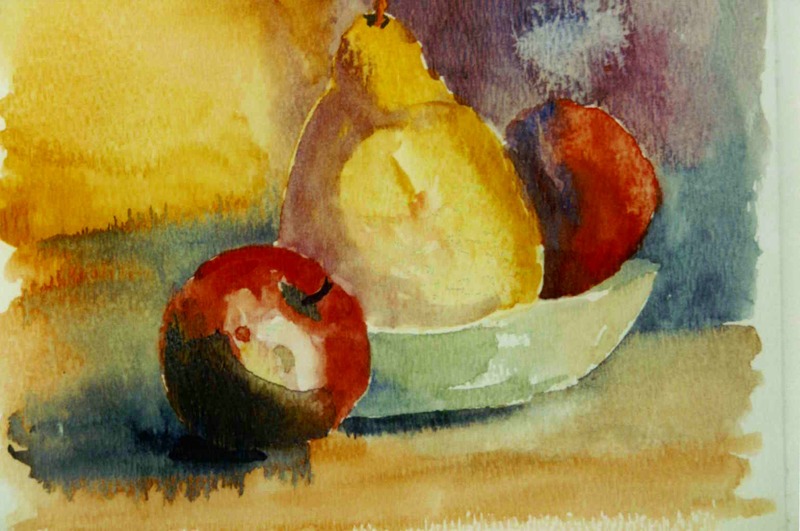 Categories: Artwork, Fun, Memories | Tags: apples, art, fruit, memories, pears, practice, still life, study, watercolor | Permalink. An old cabin just off the Blue Ridge Parkway / Skyline Drive near the Peaks of Otter in Virginia. Found this place, and the nearby Peaks of Otter Lodge, Abbott Lake, and Sharp Top mountain. Lots of trails, hike, or tram, up to the peak of Sharp Top and either ride back down or follow the easy descent on a well marked trail. Food at the restaurant is fabulous. A fall stay was an opportunity to enjoy fresh berry cobbler at breakfast, lunch, and dinner when we visited. Tranquil and restful with some of the most beautiful sunsets you’ll ever see with Sharp Top reflected in Abbott Lake. Categories: Art, Beauty, Fridays Art, Hike, Nature | Tags: art, blackberry, blue ridge, cabin, cobbler, hike, hiking, lake, lodge, mountain, national park service, nature, otter, parkway, peak, photography, reflection, restful, sharp top, skyline, summit, sunset, trails, tram, tranquil, vacation, Virginia, watercolor | Permalink. 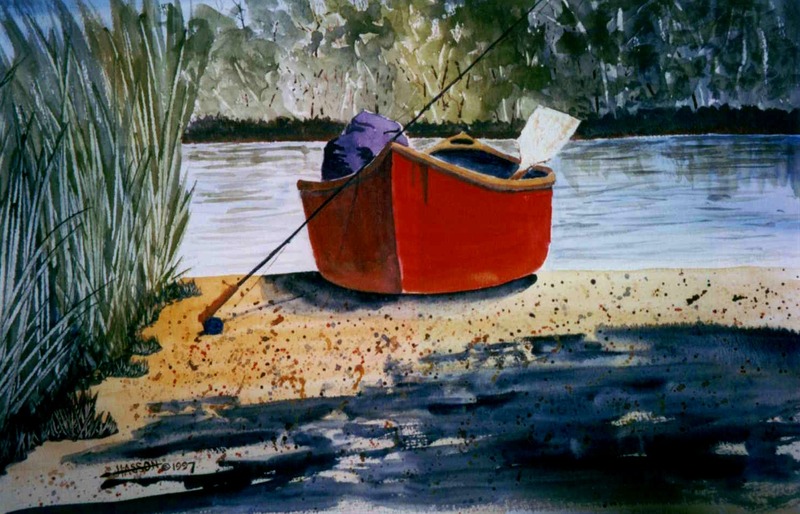 Categories: A little rant..., Artwork, Fridays Art, Fun, Nature | Tags: art, canoe, Fishing, fly, fun, lures, nature, opening, painting, ready, red, small water, spring, Trout, watercolor | Permalink. 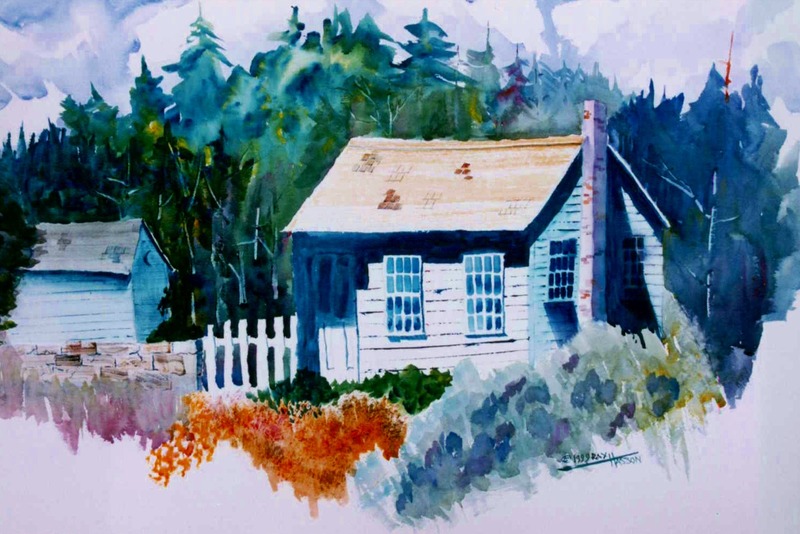 At one time I thought I could be much more productive if I just took photos of scenes that I wanted to paint. So instead of sketching I’d just whip out the camera, frame, shoot and move up the road, path, etc. When I got the pictures back – oh yes, dating myself be admitting this was in the day of film and developing and printing photos – I knew when, and where, but couldn’t for the life of me see what it was that had attracted me to that scene as a potential painting. That never happened with sketching because by definitiion the sketch captured what need expressing. 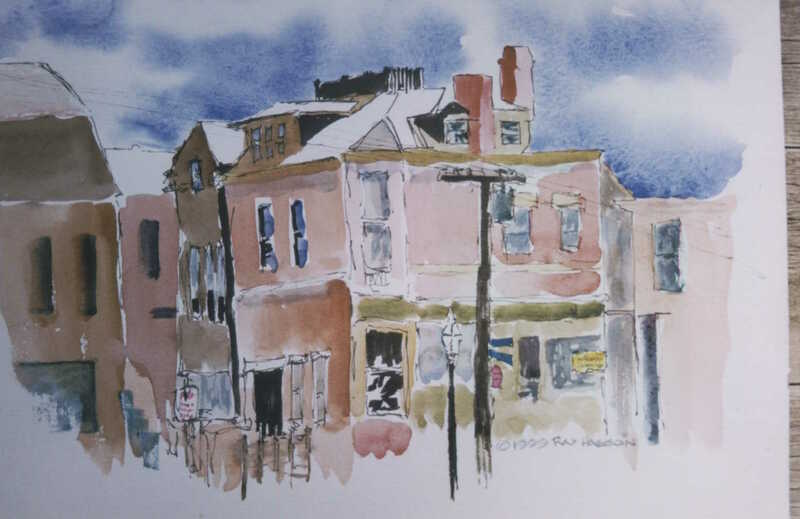 So here’s a quick sketch from a Sunday in Newport, Rhode Island. So much worth capturing in Newport and it’s a great place to spend a day just wandering around. Mansions, Cliff Walk, 2nd Beach… On and on. Categories: Art, Creativity, Fun | Tags: art, colorful, creating, fun, lazy days, Newport, pubbing, Rhode Island, sightseeing, sketch, Sunday, wandering, watercolor | Permalink. Winter painting is always a challenge so most of this was done back in the studio. Colors can be a surprising thing in nature. The black roof that’s white in bright sunlight, this pool of water that is so cold it’s black. Sketch book and camera, back to warm truck, finish in studio. And here we are the end of March, into Spring, and the weather peeps are predicting snow. 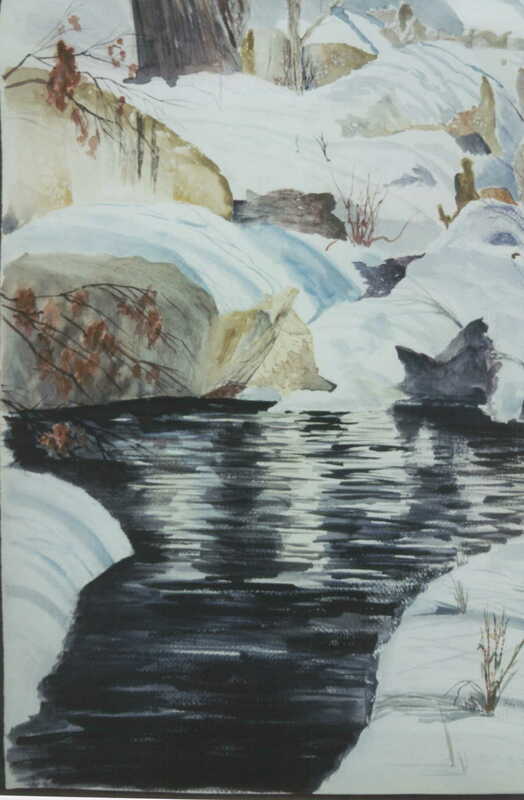 Categories: Art, Creativity, Fridays Art | Tags: beauty, cold, color, effects, mill race, nature, sketch, Snow, spring, studio, surprising, water, watercolor, Winter | Permalink. 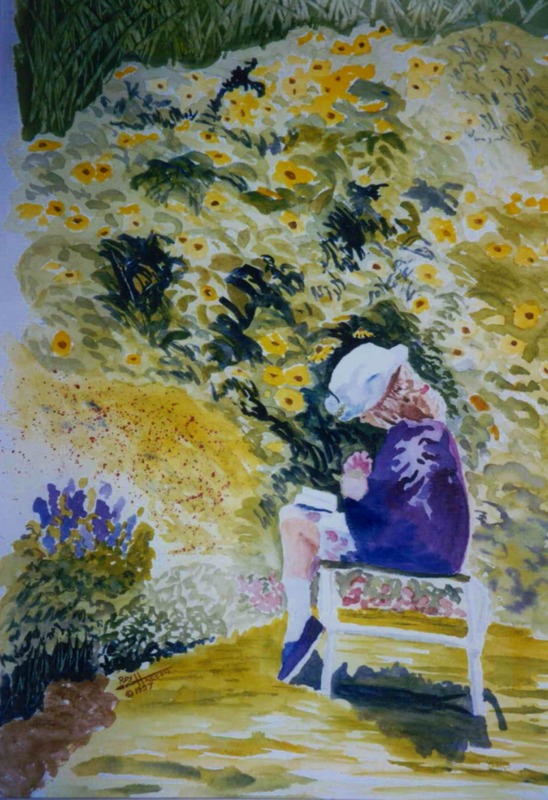 Sunday’s Child, watercolor, private collection, was one of those serendipitous moments on a sketching day in early spring when I was exploring an old mansion and its grounds. There were two formal walled gardens. I turned into one and there was the perfect picture. A moment of life frozen in time. Categories: Art, Artwork, Fridays Art | Tags: art, beauty, being, child, garden, reading, serendipitous, spring, watercolor | Permalink.